The potential for reducing technical losses can provide distribution network operators with significant network efficiencies and the potential to maximise asset utilisation. This project, commissioned by UKPN through Ofgem’s losses discretionary reward, focuses on the empirical evaluation of a losses reduction strategy based on LV network voltage optimisation (reduction). 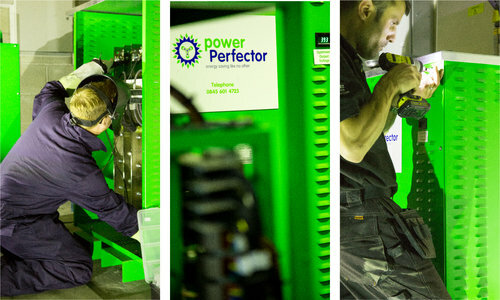 This entails testing a voltage optimisation and balancing solution – the powerPerfector iQ (PPiQ). To quantify the reduction of losses achieved and evaluate the overall performance of the PPiQ, the device was connected to the PNDC LV network and subjected to comprehensive tests that reflect realistic loading conditions. It was found that the PPiQ, through the reduction of its output voltage, was able to achieve a reduction in cable losses of more than 20% depending on a number of factors. For a single mock impedance (approx. 600m of cable), the maximum cable losses reduction achieved is 11.5 kW for 185.5 kW load with a pre-optimisation source voltage of 253 V.